Drug-coated stents that prop open the arteries of about 3 million people in the U.S. don't increase the risk of heart attack or death when used as labeled but may put patients at risk for blood clots, health advisers said Thursday. While the panel of experts broadly dismissed the more serious risks, they split on characterizing the degree of the increased clotting risk in comparison with older, bare-metal stents. They agreed only that more study of the newer devices is needed. "There may be something there. From an evidence-based perspective, I can't say definitively one way or another," said panel member Dr. Norman Kato of the Cardiac Care Medical Group of Encino, Calif.
About 800,000 Americans a year receive the stents, reports CBS News medical correspondent Dr. Jon LaPook, so even a small risk can translate into serious problems for a significant number of patients. Another panel member, Dr. Steve Nissen of the Cleveland Clinic, said the clotting risk was real and that only its magnitude was in question. "There is pretty unequivocal evidence," Nissen said. The panel said any safety concerns fail to outweigh the benefits of the stents — tiny mesh tubes used like scaffolding to keep blood free-flowing through the arteries. Drugs that coat the stents elute, or dissolve, into the bloodstream to prevent re-clogging of arteries. "The message is drug-eluting stents are safe and that the safety concerns are far outweighed by evident clinical benefit," panel chairman Dr. William Maisel, of Beth Israel Deaconess Medical Center in Boston, told reporters. The mixed verdict came at the outset of a two-day meeting of the Food and Drug Administration advisers, convened to discuss possible clotting and associated risks of the drug-coated stents. The panel's findings Thursday apply only to the minority of patients for whom the FDA-approved labeling says use of the stents is appropriate — and not to the broader, "real-world" use. Today, more than 60 percent of drug-coated stents are used in patients not covered by the labels, including cases when they're implanted to fix narrower arteries or more complex blockages than those studied in trials done to win FDA approval. The panel of FDA advisers was to discuss that so-called off-label use and its risks Friday. Boston Scientific Corp. and Johnson & Johnson, the two manufacturers with U.S. approval to sell the drug-coated stents, also said the benefits of the devices outweigh their risks. 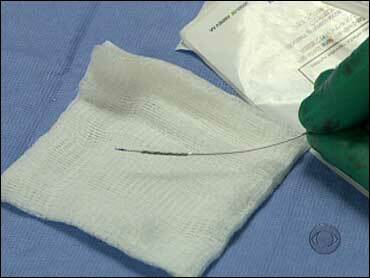 FDA staff, however, believe drug-coated stent patients could face a small but significant chance of blood clots. "Are you certain of that conclusion?" asked panel member Dr. John Somberg of Rush University Medical Center in Lake Bluff, Ill.
FDA medical officer Dr. Andrew Farb said he was, after acknowledging the difficulty of acting on that information. "When we have rare events in relatively small numbers, to come up with sweeping conclusions can raise issues," Farb said. Some researchers believe clotting associated with the stents leads to an increased risk of heart attack and death — a danger the FDA said is unknown. Boston Scientific acknowledges a slight increase in clotting associated with its drug-coated stent, the Taxus. The company said it has seen no corresponding increase in heart attacks or deaths. "At the end of the day, the things patients care about — 'Am I more likely to be dead or have a major heart attack?' — the answer is 'no,"' said Dr. Donald Baim, Boston Scientific's executive vice president and chief medical and scientific officer. Johnson & Johnson said there is no significant difference in clotting, heart attack or death rates between its stent, the Cypher, and bare metal versions. Both companies said use of the drug-coated stents reduces the need for follow-up surgeries to reopen clogged arteries when compared with bare-metal stents. That accounts for the widespread use of the drug-coated versions since their introduction in 2003. Multiple studies have suggested the risk of blood clots, heart attack and death rises in patients who stop taking Plavix earlier than now recommended. Some doctors recommend patients stay on it indefinitely until more is learned. The panel recommended labels on the devices be updated to reflect those studies. Earlier, FDA staff said it is unknown how long patients should take the drug, distributed by Bristol-Myers Squibb Co. and Sanofi-Aventis SA, citing the risk of bleeding. The panel also said patients should talk to their doctors before stopping or restarting use of Plavix. On Friday, the FDA also will seek recommendations for research on the drug-coated stents on the market or pending approval. Both Medtronic Inc. and Abbott Laboratories hope to enter the more than $5 billion U.S. market for the drug-coated stents.